Carlos Ramirez y sus Amigos is a Bay Area based Latin American group. Led by singer, bass and guitar player Carlos Ramirez, Carlos Ramirez y sus Amigos specializes in the Classic Latin American repertoire. From Sones to Boleros to Guarachas and Cha-Cha-Chas, Carlos Ramirez y sus Amigos has been making Bay Area audiences dance for the last ten years. Born in Colombia, Carlos Ramirez moved to Puerto Rico as a teenager where he eventually found his way into the Conservatorio de Musica de Puerto Rico (located in San Juan). Since his conservatory stint, he has lived in a combination of Bogota (Colombia), Caracas (Venezuela) and the San Francisco Bay Area. He has performed professionally in these various countries for the last 30 years, and is considered a top notch, first call sonero and bass player. 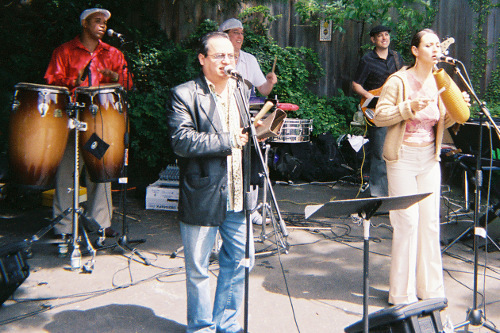 On many given nights, you can see him performing with a variety of Bay Area salsa bands. He also has been a long time resident of the St. Francis Hotel Lounge band (where Carlos Ramirez y sus Amigos was founded). Carlos Ramirez y sus Amigos is perfect for any event, as they have performed at a variety of weddings, corporate function, and parties of all sizes. If the classic Latin American sound is what your even is looking for, Carlos Ramirez y sus Amigos is your band! !